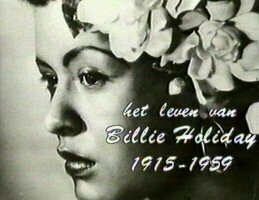 A profile of Billie Holiday combining reminiscences of her associates and friends (Leonard Feather, Milt Gabler, Milt Hinton, Artie Shaw, Sylvia Syms and Alice Vrbsky), mostly uncut performances and film excerpts of "Fine and Mellow" from the CBS television program The Seven Lively Arts. The Sound of Jazz (with Vic Dickenson, Roy Eldridge, Coleman Hawkins, Gerry Mulligan, Ben Webster and Lester Young) and the 1934 Duke Ellington short, Symphony in Black. A clip of "Strange Fruit" closes in on Holiday's expressions and documents the "strange fruit, black bodies swinging from the poplar trees" to emphasize the meaning of the lyrics.